Why I love to work with families! What do you love about teaching these kinds of classes? I am passionate about fostering connection between people, families, and children. 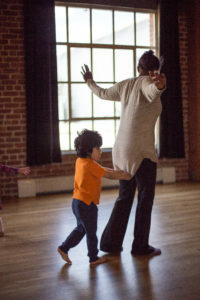 Teaching Dance With Me provides a fertile place for bringing all kinds of people together and allowing them the space to breathe, move, and express themselves. Children see their parents or other adult caregivers in a new way, and vice versa. The group energy surrounds everyone with acceptance and joy. Friendships are fostered and new relationships bloom. Smiles abound at the end of class. Dance With Me is where happiness and love grow. It is a blessing to lead these classes week after week. How did you learn to teach this class - content, pace, etc? Who are your role models? I was fortunate to take Music Together with a friend’s child when he was much younger. It was a wonderful experience. I was delighted each week by all the fun songs and games. I loved the pace and the overall structure: each week had something familiar, something new, the patterns were clear but never seemed stale. I knew I could translate this type of adult-child learning into a dance format. A few years later I did thanks to a few new mothers who wanted to get back to class with their pre-school aged children. Those first students are now in seventh grade! I wanted the class to have a flow that allowed for more vigorous exercises tempered with times of stillness and stretching. Moving in and out and across the floor, using a circle to bookend the class each week. One of my first “big dancers”, a mother and friend, Dana Lawton, suggested a song to end the class. I made it up on the spot and it hasn’t changed in over 10 years! I love reading to children so we always have a “cool down” story time featuring a book about dance or poetry. Jill Randall inspired this literary component. I am inspired everyday by the world around me and the movement that occurs every where. I pull from this inspiration and I follow my intuition each week. It is a dance of its own to lead and follow with a group of people in the studio. I am grateful to Shawl-Anderson Dance Center for saying YES to an idea that has brought Dance With Me to life. 3. What are some of the challenges? Challenges…well, they can be numerous and on the whole I just roll with what shows up. Safety often is foremost. When a large group of young children begin to move it can mean injury or at the very least “bonks” can happen. One of my favorite phrases is, “eyes front” as the stream by looking at themselves running the mirror with no awareness of what is ahead of them: a wall, another child, an adult. Collisions and tears do occur but not too often thankfully. Pre-school aged children are unprediticable. I accept them where they are each week and don’t take any of it personally. I try to encourage everyone to participate fully, the adults sometimes need the most urging, and keep chatting to a minimum if possible. With more rambunctious or disruptive children, especially when the parent seems to be struggling or overwhelmed, I will lead with a more forceful tone. I also cut any “bad” behavior off immediately (like screaming, hitting, pushing) and the expectations are clear from moment one. Everyone knows what Dance With Me is about: having fun, working together, and following directions to the best of your ability. I know from feedback that it translates to home life. The best part of dancing with young children is watching what they come up with, and then guiding them further. I am amazed each week by the creativity, the willingness, the ways they love to express themselves and dance with their partent/caregiver, me, others in the room. I just have to ringlead sometimes and everything unfolds perfectly. Props are always magic. If a child has been hesitant or “non-participatory” (I don’t adhere to this concept and trust each child is making their way in as they see fit) there is nothing like a colored scarf or giant hoop to get them on the dance floor. My drum has become my partner in leading Dance With Me. With the drum I can get everyone’s attention, I can create choreography and rhythm, and get the children to focus. Some weeks I can feel the entrainment the drum and rhythm provide. I use my drum constantly. And now have a tambourine too!